The Clean Coalition started as the FIT Coalition in early 2009. We relaunched as the Clean Coalition in 2011. Since our founding, we have worked to design, promote, and implement clean energy programs and policies. The Clean Coalition works with leaders from communities, utilities and other load-serving entities, businesses, and governments to advance clean local energy. We are active on the local, state, and national levels. The Clean Coalition has had significant impact shaping policies and programs that enable the deployment of clean local energy to address climate change and secure economic, environmental, and resilience benefits for communities. Through cutting-edge programs, policies, and initiatives, we have helped bring nearly 3 gigawatts of clean local energy online — enough to provide peak power to nearly 3 million American homes. Designed and implemented Feed-In Tariff (FIT) programs across the United States, from California to Indiana to Vermont, bringing hundreds of megawatts (MW) of local renewable energy online. Established precedent-setting interconnection policy in California, which was adopted by federal energy regulators as a new national standard, making it quicker and cheaper to connect clean local energy projects to the grid. Issued studies that influenced major decisions under California regulatory bodies to stall and stop construction in Southern California of gas plants in favor of solar+storage solutions. Led the creation of California’s innovative Distribution Resources Planning proceeding, which requires the state’s largest utilities to proactively plan for — and deploy — distributed energy resources (DER), such as local renewables and energy storage. Shaped New York’s Reforming the Energy Vision proceeding and received one of the first five NY Prize Community Microgrid Competition grants for our Long Island Community Microgrid Project. In addition to these successes, we’ve accomplished much more. See our Timeline of accomplishments for details. The Clean Coalition plays a vital role helping utilities and policymakers adopt forward-thinking policies and programs. The Clean Coalition is a leading advocate for a modernized electrical system characterized by high levels of clean distributed generation integrated with intelligent grid solutions, which will empower consumers and drive innovation in power generation, delivery, and use. The result will be fundamentally improved electricity efficiency, reliability, and environmental protection. Our work on behalf of a clean local energy future is made possible by the generous support of foundations, organizations, and individuals like you. The Clean Coalition partners with the City of San Diego to participate in the Solar Energy Innovation Network (SEIN). The partnership is a significant step in helping San Diego meet its ambitious clean energy goals. SEIN explores new ways solar energy can improve the affordability, reliability, and resilience of the nation’s electric grid. The City of San Diego is one of nine teams selected by the U.S. Department of Energy’s National Renewable Energy Laboratory (NREL) for this collaborative effort. The Clean Coalition helps San Diego unlock solar potential by conducting a Solar Siting Survey and designing a feed-in tariff with streamlined interconnection. The Clean Coalition launches the Goleta Load Pocket Community Microgrid Initiative, which provides a unique opportunity to bring resilience to the region with indefinite renewables-driven energy for critical emergency response and recovery facilities — while building back right in areas damaged by recent wildfires and debris flows. This deployment of clean local energy will showcase the grid of the future and will provide economic, environmental, and resilience benefits to the community. For two years, the Peninsula Advanced Energy Community (PAEC) Initiative, with grant support from the California Energy Commission, studies what we can do to accelerate the deployment of Advanced Energy Communities (AECs). A Master Case Study report from the initiative details measures that government agencies and utilities can take to help build this future as soon as possible. Along with the World Business Academy, the Clean Coalition launches the Montecito Community Microgrid Initiative. The Montecito Community Microgrid Initiative provides a unique opportunity to ensure indefinite renewables-driven energy for critical emergency response and recovery facilities. This deployment of clean local energy will showcase the grid of the future and will provide economic, environmental, and resilience benefits to the climate ravaged community. The Clean Coalition has played a major role in holding California’s investor-owned utilities accountable for the significant amounts of clean energy they were required to procure and connect to the grid under the California Public Utility Commission’s (CPUC) Renewable Auction Mechanism (RAM). The RAM program was designed to streamline and hasten the advancement of sub-20 (MW) distributed renewable energy projects in the state. Pacific Gas & Electric (PG&E) makes various attempts to delay or cancel their clean energy procurements required under RAM and, in response to these attempts, we intervene to ensure that this crucial market segment is supported in California. The Clean Coalition, along with several strategic partners, launches the North Bay Community Resilience Initiative. The North Bay Community Resilience Initiative seeks to make the best of an otherwise tragic situation after the devastating October 2017 wildfires that swept through the North Bay in California. PG&E offers full support of the initiative, including a rebuild program for homes, a Community Microgrid, and overall grid modernization effort. The initiative also has support from Sonoma Clean Power, the community choice aggregator (CCA) in the area. Other collaborators include: Center for Climate Protection, County of Sonoma, Energy & Sustainability Division, Regional Climate Protection Authority, and Bay Area Air Quality Management District. In response to a ruling that the state’s Renewable Market Adjusting Tariff program did not meet PURPA requirements to offer long term fixed price contracts for distributed renewable resources up to 3 MW, the Clean Coalition successfully advocated to the CPUC in conjunction with other parties to open a new Rulemaking on an accelerated schedule to implement uncapped long term contract offers to purchase energy from PURPA defined Qualifying Resources at their full avoided cost value as determined at the time of the contract. This will offer reliable and predictable income to cost effective distributed renewables while also reopening ongoing ReMAT procurement. Providing world leading detailed reliable data on the ability of the grid to accommodate additional DER without triggering grid upgrades, published and updated monthly for every node on every line section and circuit. Some confusion over the application of proposed data redaction standards has potentially delayed publication until the end of the year, but we are addressing this with the Commission. This new resource identifies locational differences in the need for energy and other grid services and their value. This is providing critical input in assessing the full value of DER and development of solicitation and other DER compensation mechanisms now being taken up by the CPUC with leading engagement by the Clean Coalition. Issues related to ICA map publication apply the LNBA maps as well. Building on the GNA, this identifies the grid needs which are likely to be cost effectively resolved through the use of DER, and provides the foundation for both direct solicitation and location specific compensation programs and policy. The Clean Coalition continues to be a leading advocate for streamlined and predictable interconnection practices. 2018 has seen continuing enhancement and refinement of standards and practices related to the process of interconnecting resources to the distribution grid under California Rule 21, a standard frequently adopted by other states. Issues addressed this year include utilizing the ICA hosting capacity data in the utility application review process, automation opportunities, ensuring telemetry is cost effective, implementing advanced inverter functions, enabling modifications in system design, and exempting distributed resources from lengthy transmission study processes. Final decisions by the CPUC are scheduled by the end of the year for implementation in 2019. Opposition from the Clean Coalition and other groups helped defeat AB 813, a bill that would have expanded CAISO into a regional electric system operator and would have further increased California’s already skyrocketing electric transmission costs. A significant development in constraining these costs was a major advance this year on our Transmission Access Charges (TAC) Campaign. The Clean Coalition was an active advocate in the CAISO stakeholder process, which included holding a full-day workshop at CAISO to educate staff and stakeholders alike. After a year-long process, CAISO agreed that the customers of load-serving entities that procure wholesale distributed generation (WDG) should probably be credited for avoiding future transmission costs, but declined to make the reform because of opposition by the utilities and remote generation owners. In response, the Clean Coalition began the process of introducing legislation in the upcoming session to direct the CPUC to take up this reform, as well as key reforms that will remove other barriers to WDG. Clean Coalition studies show that solar+storage can cost-effectively replace the proposed Puente Power Project natural gas plant in Oxnard and the Ellwood Peaker Plant near Santa Barbara, both in the Moorpark Subarea, a grid-constrained area in Southern California. These studies are instrumental in the denial of the Puente project by the California Energy Commission (CEC) and the rejection of the Ellwood project by the California Public Utilities Commission (CPUC). As a result, many analysts question whether another gas plant will ever be built in California. The CEC selects the Clean Coalition to receive a grant for our Valencia Gardens Energy Storage project. In collaboration with partners like Pacific Gas & Electric (PG&E), the California Independent System Operator (CAISO), and the City of San Francisco, the Clean Coalition leads this project to add grid-scale energy storage to the roughly 800 kilowatts (kW) of rooftop solar that is already interconnected to the distribution feeder around the Valencia Gardens Apartments, a large low-income and senior housing apartment complex near downtown San Francisco. The Clean Coalition’s work to expand electric vehicle (EV) charging infrastructure in Palo Alto moves forward with the unveiling of new solar carport installations atop four City-owned parking structures. The solar carports and the EV charging infrastructure are possible only because of the Palo Alto Feed-in Tariff (FIT), which the Clean Coalition helped establish nearly five years ago. PAEC — a collaboration with the CEC — continues to streamline policies and showcase projects that facilitate clean local energy and other advanced energy solutions like energy efficiency, energy storage, and EV charging infrastructure. PAEC is a model for communities across the country that want to reap the trifecta of economic, environmental, and resilience benefits delivered by Community Microgrids, Solar Emergency Microgrids, and more. The Clean Coalition makes progress on our campaign to eliminate the massive market distortion of 3 cents/kilowatt-hour (kWh) that TAC steal from local renewables in investor-owned utility service territories, including from Community Choice Aggregators. The 2017 legislative cycle features the Clean Coalition-sponsored Senate Bill 692 to force CAISO to fix the TAC distortion by implementing a consistent statewide “user-pays” approach. In response, CAISO starts the Review TAC Structure Stakeholder Initiative, which is based on the Clean Coalition’s proposed TAC fix. By the end of 2017, nearly 100 supporting organizations sign on to ensure our proposal is adopted. The Clean Coalition’s work is recognized by the People’s Action for Clean Energy, with their 2017 Judi Friedman Clean Energy Leadership Award for bold and creative leadership in the field of clean energy. The Clean Coalition partners with East Bay Community Energy (EBCE), part of California’s rapidly expanding Community Choice Energy market, to develop a program for deploying more clean local energy in Alameda County. Our Solar Siting Survey shows enormous opportunity for solar deployment in the region, and the innovative FIT with Market Responsive Pricing we designed for EBCE includes a Dispatchability Adder to incentivize energy storage. The Clean Coalition helps set the stage for a showcase solar+storage solution that spans multiple sites on the Hawaiian island of Kauai. The solution is a game changer for the electricity industry because it illuminates the cost-effectiveness of local solar energy that is delivered when desired, rather than only while the sun is shining. The Clean Coalition was engaged to conduct analysis that maximized economic value and minimized fossil fuel usage for a solar+storage solution that will provide energy at 11 cents/kWh, which is 10% less than the 12.5 cents/kWh average cost of electricity in the United States. The same type of solar+storage solution can be configured to provide indefinite renewables-driven backup power to critical community facilities. This Kauai example, which spans multiple sites, combines 28 MW of solar with 20 MW/100 MW-hours of batteries and will provide 11% of Kauai’s electricity once online in 2018. The Clean Coalition launches the Peninsula Advanced Energy Community, which was one of 13 projects selected for funding by the CEC. The PAEC will address policy, permitting, and financing barriers impeding the development of Advanced Energy Communities. Collaborators include PG&E, SamTrans, Facebook, Stanford University, and Kaiser Permanente. Working with the Clean Coalition, the City of Palo Alto creates a new model for deploying local renewables on municipal properties. 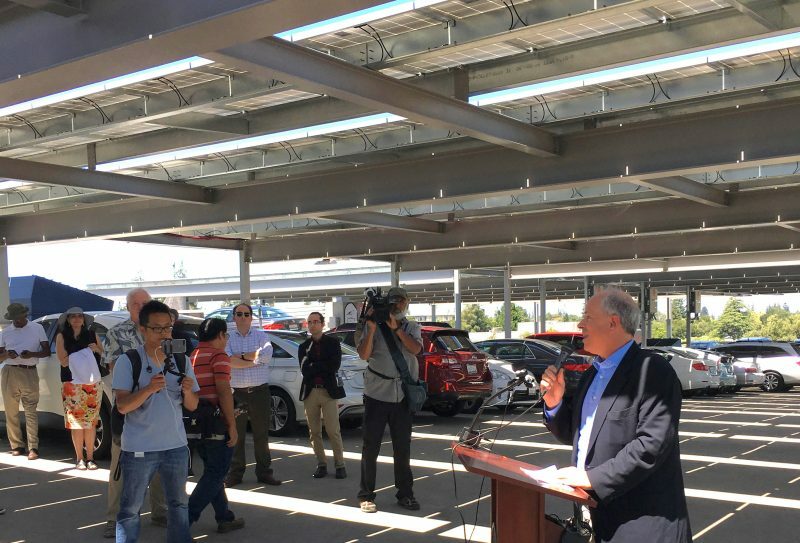 Sustained efforts by the Clean Coalition and the City of Palo Alto brought 1.3 MW of local solar atop four City-owned parking structures, along with a significant amount of EV charging infrastructure. The CPUC approves the Clean Coalition’s proposal to require all of California’s investor-owned utilities to publish a Unit Cost Guide, which is designed to improve pricing transparency, predictability, and consistency for the interconnection of distributed generation projects. The CPUC issues a decision on the Green Tariff Shared Renewables program, which included the Clean Coalition’s recommendation to include sub-500 kW renewable energy projects. This important modification will enhance the number of siting opportunities for clean local energy in the built environment. The Clean Coalition successfully advocated for a NEM bill credit valuation methodology for solar systems paired with energy storage. This is a solution that will properly value energy export credits based on the size of the storage device, overall system, and consumption patterns. Georgia Power’s Advanced Solar Initiative, designed using our Local CLEAN Program Guide, brings over 735 MW of clean energy online. The Advanced Solar Initiative has enabled Georgia Power to cost-effectively expand its renewable portfolio, including 190 MW of local solar, without raising customer rates. The Clean Coalition plays a significant role in refining California’s new regulatory mechanism incentive pilot. The pilot requires each utility to identify at least one grid-scale project — and authorize up to three additional projects — where the deployment of distributed energy resources would displace or defer the need for significant costs associated with new energy transmission infrastructure, such as power plants and power lines. The Clean Coalition’s Long Island Community Microgrid Project launches in New York, serving as a model for the state and country. The project was one of the first to be awarded funding by Governor Cuomo in the NY Prize Community Microgrid Competition. The Clean Coalition conducts Solar Siting Surveys to study and demonstrate how DER, including local solar photovoltaics, may support local reliability needs. The Clean Coalition guides the CPUC’s implementation of distribution resources planning requirements. The Clean Coalition launches a campaign to remedy the unfair TAC being imposed on local renewable energy in California. As the primary intervener in a motion with the Federal Energy Regulatory Commission to reform interconnection reporting methods, the Clean Coalition sets a standard for publishing data by allowing easier access to information when applying to add clean energy to the grid. The Downtown Palo Alto Net Zero Energy Initiative, initiated by the Clean Coalition, aims to achieve net zero energy for at least 100 existing commercial buildings in downtown Palo Alto by yearend 2017. Additionally, the Clean Coalition leads the process to bring solar projects to five City-owned parking structures. The Clean Coalition works with utilities to establish FIT programs, such as the Northern Indiana Public Service Company’s FIT 2.0 and Sonoma Clean Power’s ProFIT program. We also help in the successful passage of the U.S. Virgin Islands’ Feed-In Tariff Act. The Clean Coalition offers recommendations on implementing the Distribution Resources Planning requirement of California’s Assembly Bill 327 (AB 327), which includes a grid planning methodology shaped by the Clean Coalition for determining the optimal locations of distributed energy resources. Advanced inverters are an effective tool for regulating voltage and enabling greater amounts of local renewable energy. The CPUC’s Rule 21 adopts numerous advanced inverter standards recommended by the Clean Coalition and makes California the first state in the country to require the use of advanced inverters with distributed generation. California Governor Jerry Brown signs into law AB 327, which mandates that the state’s largest investor-owned utilities proactively plan for a distributed power system. The new law brings together years of Clean Coalition work by including our language and recommendations and marks a significant step forward in smarter grid planning by ensuring that California ratepayers are protected from unnecessary investments in the outdated centralized power system. In collaboration with PG&E, the Clean Coalition initiates the Hunters Point Community Microgrid Project. Once complete, this project will result in $200 million in regional economic stimulation and preserve 375 acres of land over 20 years, while eliminating 78 millions of pounds of toxic greenhouse gas emissions and saving 15 million gallons of water annually. Senate Bill 1122, designed by the Clean Coalition, is passed, which requires the state’s largest investor-owned utilities to create an additional 250 MW of capacity for biopower projects. Vermont Governor Shumlin signs into law the 2012 Energy Bill, which contains groundbreaking acknowledgement of the environmental and economic benefits of clean local energy and more than doubles the amount to be brought online through the state’s CLEAN Program. The Clean Coalition provides leading policy support to Vermont-based clean energy organizations engaged in the legislative process. The Clean Coalition is highly involved in the CEC’s 2011 Integrated Energy Policy Report, which includes research and analysis of energy demand and generation trends relevant to California’s 33% Renewable Portfolio Standard and Governor Brown’s 12,000 MW goal for distributed generation. The Clean Coalition’s involvement results in a number of victories for proponents of distributed generation. Working with developers, Southern California Edison, the California Governor’s office, and the CPUC, the Clean Coalition removes barriers within the California Renewable Energy Small Tariff — demonstrating that with proper stakeholder collaboration, the clean local energy market can be unleashed to create powerful and immediate economic benefits for California communities. The Clean Coalition successfully prevents California utilities from weakening the Renewable Auction Mechanism, a program designed to bring clean energy online. The utilities sought to continue use of an inadequate data map, unfair deliverability requirements, and less frequent auctions. As a result of the Clean Coalition’s persistent requests, PG&E creates an online map and information resource to improve the process of connecting renewable energy to the grid. This lays the foundation for more advanced distribution grid mapping required in California’s Distribution Resources Planning proceeding. The Clean Coalition has been a valued partner to Palo Alto as they continue to work toward reaching their ambitious carbon emission goals. With its wealth of industry knowledge and unique combination of policy, economic, and technical expertise, the Clean Coalition has advised Palo Alto using models that can be replicated throughout the U.S.
As a former California Energy Commissioner, I know how critical it is to fight for good policy at the regulatory level. I was impressed this summer by how the Clean Coalition was able to organize so many organizations, companies, and individuals in fighting for distributed generation in some otherwise obscure regulatory venues. We need the [Clean] Coalition to keep fighting these battles. The Clean Coalition has made significant contributions to advancing a renewables-based electricity system in the U.S. Virgin Islands. In addition to supporting the multi-year Feed-In Tariff effort, the Clean Coalition has envisioned and modeled a comprehensive Community Microgrid that can serve all of St. John; and cultivated support from Virgin Islands policymakers and utility officials. The Clean Coalition's work plays an important role in transitioning the Virgin Islands to renewable energy.